HELI-CAL Flexured U-Joints Provide Precise Operating Characteristics » Electronic Salesmasters Inc.
A universal joint is a mechanical connection between rotating shafts which are generally not in parallel, but intersecting. “U-joints” transmit torque and motion. U-joints are used in a variety of applications, wherever handling significant angular misalignment is the main focus. Typical applications include: articulating mechanisms, food processing equipment, replacement for expensive gearboxes, and drives where motor position must be moved angularly off centerline of the driven unit. The oldest and most common type of u-joint is called the Cardan or Hooke type joint. It consists of hub yokes, connected by a cross shaped intermediate member. These popular u-joints are frequently used in automotive applications. Because the design incorporates several different piece parts, the moving parts of this type of u-joint usually require lubrication; and as the joint wears, the amount of backlash or free play within the joint itself grows. Even a lubricated Cardan u-joint will require periodic maintenance, and may leak lubricant. 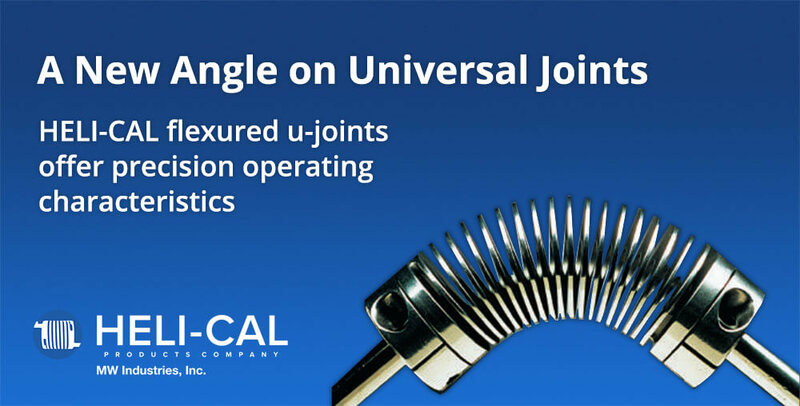 The “HELI-CAL Flexure” is an advanced and unique u-joint solution that generally exceeds the capabilities of common u-joint designs. A Helical u-joint is really a flexure capable of over 5° of angular misalignment. It may accommodate up to 90° of angular misalignment in certain circumstances. This type of u-joint will also compensate for axial and parallel misalignment. A frequent application of the Helical flexured u-joint is the direct replacement for a 90° bevel gearbox. Gearboxes are expensive, and usually need lubrication for their meshing gear surfaces and bearings. Replacement with a maintenance free Helical flexured u-joint can save money, both on initial purchase price and on maintenance costs. Flexured u-joints can be beneficial most anywhere—for example, aerospace, appliances, electronics, control mechanisms and drives, medical and optical devices, sewing machines, instrumentation, and textile machinery. The performance capability of each HELI-CAL Flexure is determined by characteristics such as flexure outside diameter, inside diameter, coil thickness, material, number of coils, and number of starts. By altering these characteristics, torque capacity, angular and parallel misalignment capabilities, torsional and lateral bending rates of flexured u-joints can be made to suit specific specifications and/or requirements. Once the designer/customer provides Helical with the performance requirements for his/her device, machine, or equipment, a specific flexure design is developed that will meet or exceed application requirements. An attachment may also be specified to securely interface with adjacent components. The result is a HELI-CAL flexured u-joint that works as an integral part of the customer’s application. HELI-CAL flexured u-joints are tailor-made for customer applications, using customers’ specific requirements as a starting point. The finished product is a HELI-CAL flexured u-joint that “fits like a glove” in the device, machine, or equipment. Helical Products Company, with its unique HELI-CAL Flexure, covers most u-joint requirements. Whether the application requires just a small angle of slightly more than 5° or one calling for a 90° bend, Helical has a “flexure” answer. This “answer” employs the infinitely variable HELI-CAL Flexure, with its amazing range of variable characteristics. No longer is it necessary to use a “one size fits all” approach to u-joints.